The Setup: According to my analysis of the 11:00 a.m. surface plot, a surface low was in SW Iowa, with a cold front extending SE into central MO then SW into NW AR. A warm front was near the IA-MO border, with the cold front occluded north of its intersection with the warm front. Additionally, a boundary of some kind - probably an outflow boundary, since there was little difference in dewpoint or temperature on either side of it - extended from near Columbia, MO to the SE to near West Plains. Ahead of this boundary the surface winds were backed to the SE or ESE, while behind it they were SW. Clouds, rain, and some convection were passing through southern IL, but clearing was evident near this boundary in SE MO. A secondary surface low, (about 1008 mb) which I took to be a mesolow, was located near or just south of the Lake of the Ozarks, along or just behind the boundary. A strong west-northwesterly upper jet was approaching the area, coming around surface and upper low pressure in SW Iowa. By 1:00 p.m., the boundary was still clearly visible on the surface plot, with SW winds to its west and SE winds ahead of it. Dew points in the STL area had risen to the low 60s, with tempratures in the mid to upper 60s. The boundary had shifted slightly eastward, especially on its southern end, but had not moved far. Thunderstorms were going up along the boundary E and NE of Columbia, and surface low pressure could be seen in SW Iowa a bit farther NE than before, and along the boundary but ahead of the cold front near Vichy, MO. Although at the time I thought this feature was a mesolow, it gradually evolved into the primary surface low, moving across central/southern Illinois and Indiana over the next 24 hours. 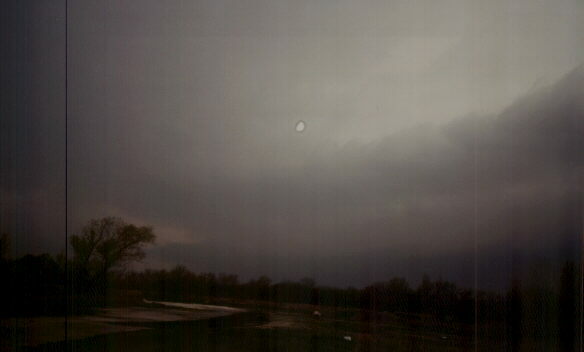 Skies were beginning to clear by around 1:30 in my area, near STL. The VAD wind profiler on STL Nexrad was showing good veering with heights, from SE at the surface to WNW at 250 mb. The upper winds were strong and increasing as the jet max approached, but the lower winds were rather week. Supercells on STL Nexrad - By a little after 2:00, 3 distinct storms were evident along the boundary to the west and WSW of STL, with a more multicellular cluster of storms farther north. The first hook echo of the day appeared around 2:35 pm. It is on the storm about midway between St. Louis and Columbia, the northernmost of 3 individual cells that had by now formed along the boundary described above. The first tornado warning on this storm was issued about this time. The storm still had a hook echo around 3:15 as it passed over New Melle, MO and approached the STL Nexrad doppler radar site near Weldon Spring. Note the next storm south is also developing a hook echo; this storm produced the only tornado of the day in Franklin Co. around 3:50. 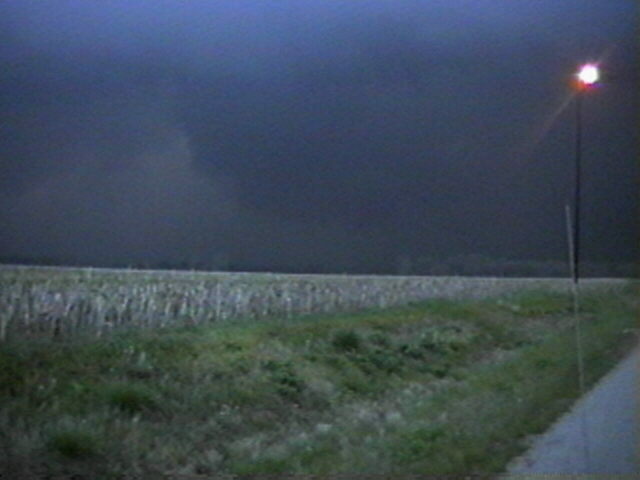 A SVR but no TOR was in effect for that county at that time. By the time of this radar image, a second tornado warning had been issued on the northernmost cell, for St. Charles Co. At 3:24, a third tornado warning was issued, for eastern St. Charles Co. and north St. Louis Co. until 4:10. 3:20 - Out the door. To avoid getting caught in city traffic, I did not attempt to intercept the supercell that prompted the 3 tornado warnings in the STL area until it crossed the river into IL. I left home around 3:30 and headed down 157 to Collinsville, turned off on Horseshoe Lake Rd. and stopped for data a check by phone with my wife. 3:40-45 - When I made this data check, I learned that a meso and wall cloud were indicated over the Bridgeton/Berkeley area, near the STL airport. I needed to get back N or NW. I continued to 111, then north on 111 to 162, hoping for good place to stop, but didn't find one with good visibility, so I backtracked east on 162. 4:15 - The tornado warning expired for STL Co, but a new warning was issued for Madison Co. - but now it was SVR rather than TOR. A severe storm was indicated in Florissant, which would put it north of 270. I backtracked east to 157 and back north on 157 to old route 66, which parallels I-270 just to its north, and took that back west to 111 for the intercept. 4:20 - 5:00 - wall cloud; storm shears apart, brief beavertail near Edw. I could see the updraft tower well as I headed west to 111. Then, between Poontoon Beach and Wood River, IL along IL-111, I watched the storm from behind warehouses about a half mile to a mile N of I-270. 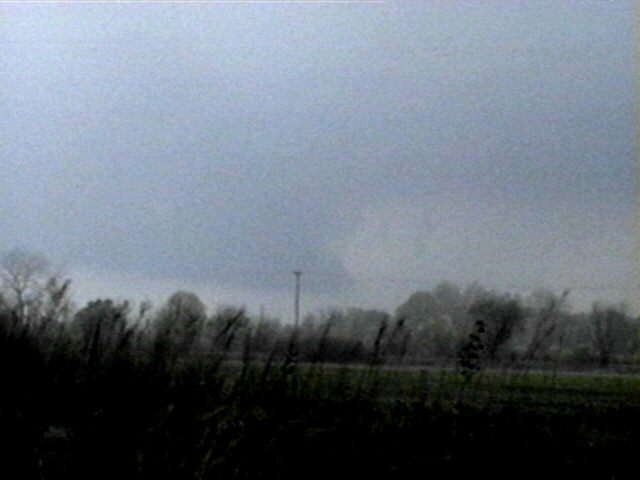 At first it had a definite wall cloud and a hard tower (shown here with the wall cloud beneath), but in after about 10 minutes the wall cloud became more raggged and poorly defined and the tower leaned downsear. By now I was watching from Poag Rd. just W. of 111. 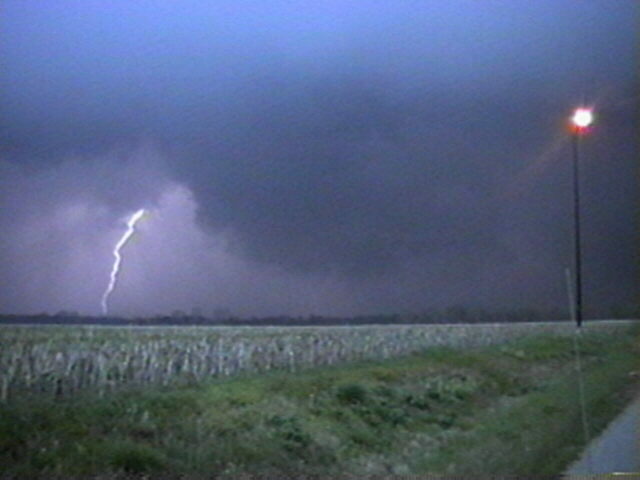 It continued to shear apart after it crossed the Mississippi River into IL, and by about 4:45 the area where the wall cloud had been had become separated from the main tower. This became evident as I booked east on Old Alton-Edwardsville Rd. to catch up with the storm, which was moving more to the NE than predicted. Having become split from much of the updraft, the backbuilding process that had kept it on a more easterly track had ended. There was most likely still some rotation in the middle part of the storm because it still had a good updraft tower despite separation from the area where the wall cloud had been, and it briefly formed a beavertail just north of Edwardsville. 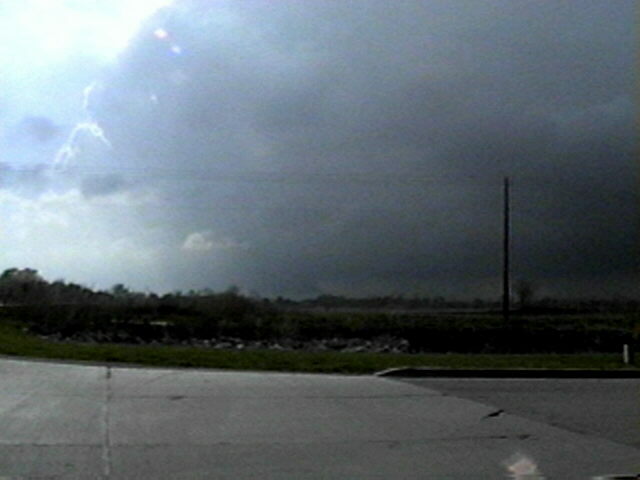 The main updraft is in the area above the left half of this picture. But the storm continued to shear apart and dissipate, so by the time I got through Edwardsville to IL-159 to pursue it northward, the bottom part of the storm was gone and it looked elevated - and within 10 minutes more there was no updraft, just an orphan anvil with a rainbow in the decreasing rain below. Although this storm had now died, it had been severe for nearly 2 hours, leaving a swath of dime to golfball size hail from Warren County, MO to near the Mississippi River. 5:05 - On 159 north of Edwardsville as the storm dissipated, I saw a new storm some distance to the NW - the updraft tower at its SW end was overshooting the rest of the anvil. I decide to start for it, & I heard a SVR warning on it, for Lincoln Co., IL, within a few minutes. I followed 159 north to 16, then went west on 16 to 67, and north on 67 to near Greenfield. 5:50-6:00 - Around this time, near Greenfield, I saw a broad, somewhat poorly organized wall cloud, which appeared at first to be two separate ones that gradually merged. 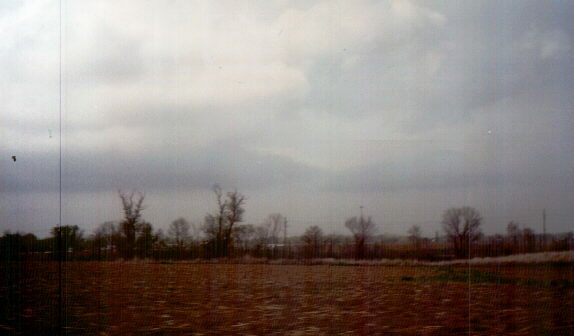 This picture was taken looking to the northwest from just south of Greenfield. 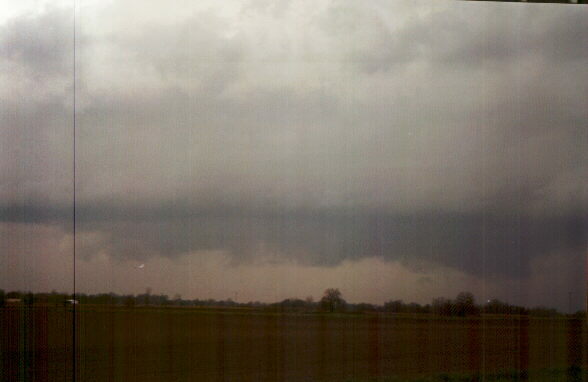 To the east of the wall cloud, on the leading edge of the precipitation core, was a shelf cloud. This cell produced a swath of extensive golfball hail between Roodhouse and Whitehall between 5:25 and 5:40, and was now passing N of Greenfield. The updraft was building into the anvil of another storm to the SW, with the result that this storm weakened after about 6:00. 6:15? - I watched the next storm to the SW intensifying, stopping at 108 & 67. This storm now had a SVR out on it, though I did not know it then due to poor NWR reception and limited warnings this far from STL on KMOX. 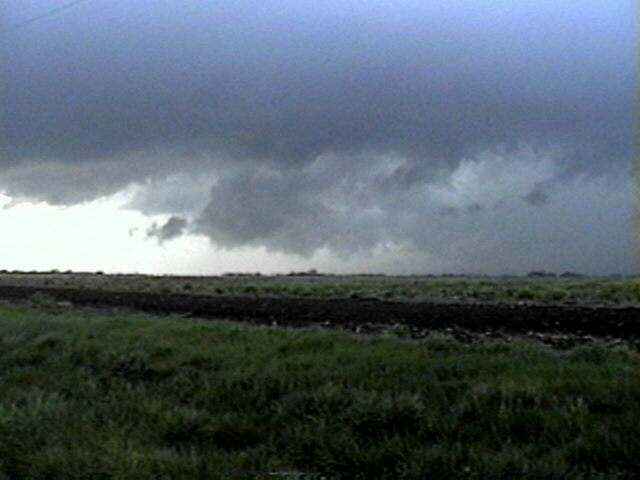 It had an intersting inflow feature extending to the east or SE from the updraft, which was being hidden by precip blowing downshear toward me. 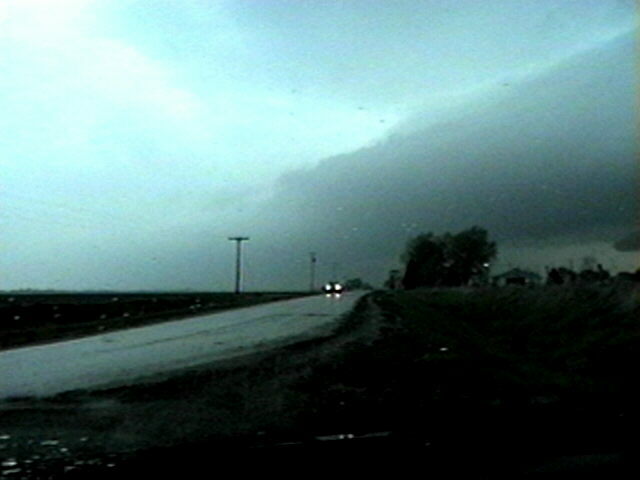 This can be seen on the left side of this picture, below where the shelf cloud appears to intersect with the updraft. But then I realized the storm was upon me, and I bailed east, stopping briefly after a mile or two to look at the intensifying storm - and I was almost overtaken. I continue east on 108 to 111, by which place I was safely ahead of the storm again. 6:30 - 6:40? I watched some scuddy RFB between storms to my northwest from the edge of Chesterfield, IL, then again saw the storm I had seen at 108 & 67, now approaching Chesterfield from the west. Again as the storm approaches I can see the shelf cloud along its leading edge extending southwestward into the updraft, and the storm still appeared to be intensifying. I bailed S and SW on 111 to get around it and stay out of its path. This storm produced 1-inch hail at Rockbridge, located a couple miles south of the 108 and 67 intersection. 6:45 - 7:00 I got around to the S and SW of the core and could see a ragged, poorly-organized wall cloud-type feature just SW of the core. Farther SW, there was more scuddy RFB between this cell and another one to the south. I was watching the storm where 111 curves to the west a few miles S of chesterfield. The warning for the cell I have been watching has been extended eastward into Macoupin County, and continued a little longer for SE Greene Co. But my escape route home was now in danger of being cut off by another storm moving from Jersey Co. into Madison Co, which also had a SVR out on it. I took 111 south to 16, crossing under and back ahead of the RFB, where the wind briefly shifted to W for the first time all day - all the time before this it had been from SE, into the storms. Now it looked very dark to the south, as the next storm was moving in, so I decided to cross through another cell to my east ahead of the stronger one, going east on 16 back to 159 to try to head S. ahead of the stronger storm. 7:15 - I crossed through very heavy rain and pea-size hail as I headed east on 16. I cleared the storm and turned south on 159, and quickly saw the storm with the warning to my SW.
By 7:30, maybe a bit earlier, the storm was approaching from the SW and appeared to be intensifying, based on a rather abrupt increase in the amount of lightning. A new SVR warning is issued about then, with reported location of the storm just NE of Alton. This corresponds well to what I was seeing. By 7:45, the storm was looking quite HPish, with a wall cloud on its front flank, as I watched this hailer from the intersection of 159 and 140. Lots of CG zapped down around me when I first arrived here, crossing just ahead of the storm - then the CG shifted to my NE. The waves in the wheatfield in front of me clearly showed the inflow going directly into the wall cloud to my west - this came out quite well on my video. 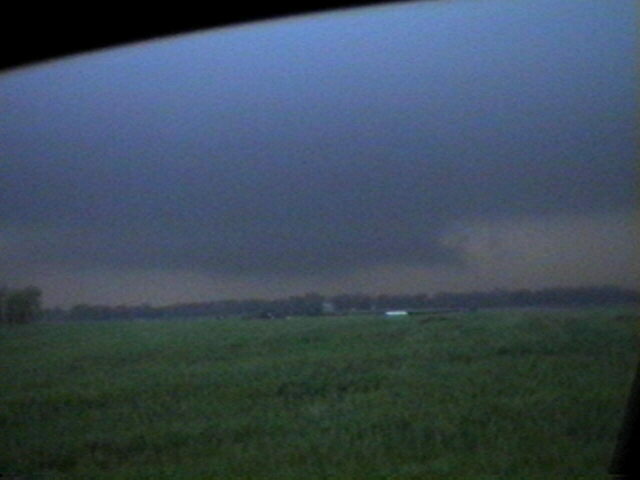 Scud was flowing into the wall cloud from the right (i.e. from its N or NE). A shelf cloud bulged southeastward ahead of the core, just NE of the wall cloud, and it looked like most of the CG was occurring just ahead of this feature. 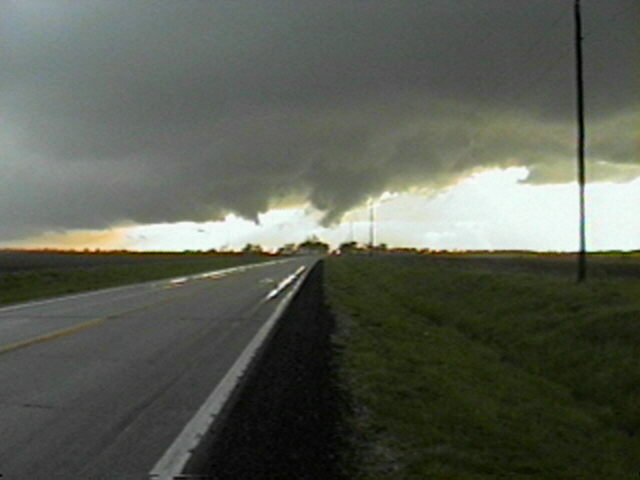 Some was also occuring near the wall cloud, which was now a little more to the NW of my position as it moved NE. This video grab, which captures the truly menacing appearance of this storm, shows one of those CGs zapping down near the wall cloud. After a few minutes I was blasted with icy outflow that was rushing ahead on the S. side of the wall cloud - only the second time all day I had been in outflow. But this time it was REALLY cold. In terms of appearance, this was the most threatening storm I had seen all day; it dropped golfball hail on Alton and probably in areas to its NE also. After a few minutes, the southern end of the storm again threatened to cut off my escape, as 3/4 inch hail fell to my WSW in Wood River. Time to get home and end the chase. Total chase distance: Don't know, because I forgot to set my trip odometer, but I would estimate around 150 miles, give or take a little. Definitely my best chase so far this year. This turned out to be quite a potent severe weather event in the STL area, with 36 reports of large hail and one tornado in the STL county warning area. This can be seen on this map of severe reports from SPC, and from the STL local storm report for the day. Surprisingly, SPC never issued a severe thunderstorm watch for the STL area, though there was one farther south. Finally, here is a radar loop (243K) from 5:30-8:00 p.m. which shows the last 3 severe storms I saw - northern Greene Co. (the first 2 frames), southern Greene and Macoupin Cos. (the 3rd and 4th frames), and northern Madison and southern Macoupin Cos. (the 5th and 6th frames). The loop appears to show that many of the severe storms occurred when the line of convection with the cold front caught up with convection associated with the boundary ahead of it, which was alligned from the NNW to the SSE.